Social Media has take the business world by storm. There are those companies who have embraced the technologies and succeeded. There are those who have attempted to embrace the technologies but have not delivered the ROI they were expecting. 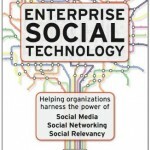 Enterprise Social Technology was recommended to me by a client. The CEO of the organisation had read the book and had driven social media to one of the key objectives this year as part of their overall marketing strategy.